Escrevo com lágrimas nos olhos. O encontro com Paul durou o suficiente para tocar minha alma. Difícil descrever o que estou sentindo. O fotógrafo dele, MJ, tirou uma foto de nós três, e depois disso eu consegui dizer uma frase, apenas uma. De alguma forma sua presença me deixou paralisada... Eu só queria dizer: Obrigado Paul pelo Meat Free Monday. Namaste. Poxa vida, não consegui! Sinto um mix de tristeza e de incrível felicidade ao mesmo tempo. Inspira a lutar pela igualdade com “Blackbird”, música que ele fez sobre os conflitos raciais nos EUA. Conta sobre “All the lonely people” (todas as pessoas solitárias), como elas vivem... Dá uma lição sobre viver no agora que é só o que temos “Yesterday all my troubles seems so far away”, (ontem meus problemas pareciam tão distantes). “Live and let die” (viver e deixar morrer), se queremos mudar o mundo, temos que olhá-lo com desapego, não nos identificando com aquilo que é passageiro. “Let it be” (deixe ser) que significa amar, olhar a vida com distanciamento. Afinal a lei do universo é simples, “In the end the Love you take is equal to the Love you make” (no final o amor que você recebe é igual ao que dá). Uma sensação profunda de paz e amor inunda meu coração, como se tivesse voltado de um retiro. Não há como agradecer o suficiente às pessoas que proporcionaram esse encontro. Não existem palavras para descrever a energia do Estádio Mineirão no dia de ontem. O movimento Meat Free Monday, criado pelo Paul, já ganhou muitos adeptos mundo afora, e é uma pena que tão poucos fãs “enxerguem o mundo da mesma cor que ele”. Poucos têm a coragem de aderir a esse convite tão sutil e eficaz, e tirar a carne do prato um dia por semana. O Encontro de ontem - de Almas - me trouxe esperança e uma força inabalável. Sim, podemos mudar o mundo! Jana Favato é professora de yoga e ministra cursos de alimentação saudável. Em 2014 virou vegetariana e criou o Desafio Meat Free Monday no Brasil, cozinhando durante 1 ano as 312 receitas do livro do movimento, que divulgou no seu blog www.alimentoevoce.com.br. Paul McCartney lhe agradeceu publicamente pelo apoio, e eles se encontraram no show que ele fez em Belo Horizonte dia 17/10/2017. I am vegetarian and yesterday I met my true idol. And he happens to be a musician too. I write with tears in my eyes. The meeting with Paul lasted long enough to touch my soul. Hard to describe what I'm feeling. On arrival he said "Meat Free Monday, woohoo!". During those few minutes I did not say much, he and my husband talked about the environmental impact caused by the animals livestock industry, necessary to meet the excessive consumption of meat. I just watched. His photographer, MJ, took a picture of the three of us, and after that I managed to say one sentence, just one. Somehow his presence paralyzed me... 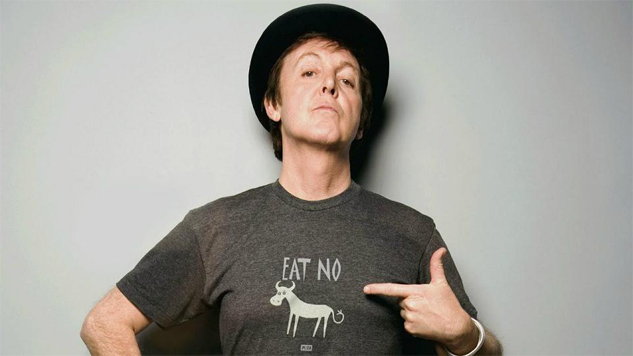 I just wanted to say: Thanks Paul for Meat Free Monday. Namaste! I couldn’t! I feel a mix of sadness and incredible happiness at the same time. After watching the show I was able to understand his incredible legacy, beyond the beautiful songs. His revolutionary way of being, instigates love, peace, freedom, equality and sense of responsibility in the world. Simply doing what he does best, and like no other. I was not as fan as my husband is, until then! It is a unique opportunity for a human being to stand before Paul McCartney and feel his divine energy. I'm really touched. Your show made me travel inside, brought me to a place I've never been to before. Observing the people in the stadium, I felt an “egrégora”, an atmosphere of goodness. Different generations were there living those unique moments, feeling the same as I felt. It brings us hope, awakens in us a deep desire to "Give peace a chance". Inspire to fight for equality with "Blackbird," music he made about racial conflicts in the United States. Tell me about "All the lonely people", how they live ... It gives a lesson about living in the now, because that's just what we have - "Yesterday all my troubles seems so far away". "Live and let die", if we want to change the world, we have to look at it with detachment, not identifying with what is fleeting. "Let it be" means to love, to look at life with some distance. After all, the law of the universe is simple, "In the end the Love you take is equal to the Love you make". A deep sense of peace and love floods my heart, as if I have come back from a retreat. There is no way to thank enough to the people who provided to this meeting happened. There are no words to describe the energy of the Mineirão Stadium yesterday. Thousands of people declaring that they want love, peace, freedom, detachment, distance, no resistance. There were more than 40,000 people there practicing yoga, this state of inner stillness, which is at the same time an uncontrollable will to do something that changes the world. The Meat Free Monday movement, created by Paul, has already won a lot of fans around the world, and it's a shame that so few fans "see the world in the same color as him". Few have the courage to adhere to this invitation so subtle and effective, and take the meat off the plate one day a week. Wonderful would be this world, where one thinks of the general well-being and not only of satisfying the individual desire. After all we are all one, Universe. Yesterday's Encounter - of Souls - brought me hope and unshakable strength. Yes, we can change the world! Long live for Paul McCartney, in this existence and forever and ever. Namaste Paul, thanks for Meat Free Monday! Jana Favato is a yoga teacher and teaches healthy eating classes. In 2014 she became a vegetarian and created the Meat Free Monday Challenge in Brazil, cooking for one year the 312 recipes from the movement's book, which she announced on her blog www.alimentoevoce.com.br. Paul McCartney thanked her publicly for the support, and they met at the show he did in Belo Horizonte on 10/17/2017.